Peppermint is probably my favorite holiday treat. Something about the cool, refreshing mint is just so appealing. I definitely indulge during the holiday season. But hey- I wait all year to enjoy myself, so why not!? Fudge is another holiday treat that my family loves. I have been seeing peppermint all over the place, but not one peppermint fudge recipe that looked like the "one". So, I decided to take it upon myself to make that come true. It was so easy. 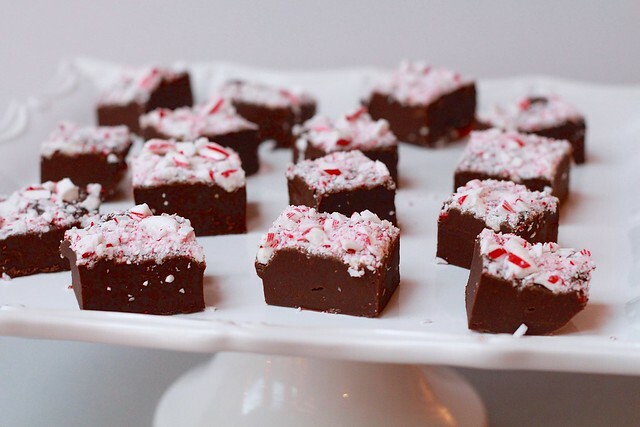 I took my favorite chocolate fudge recipe, and converted it to peppermint. Brilliant! (Is it acceptable to toot my own horn like that?) This is it folks, you need not look any further! The perfect holiday treat to enjoy yourself or bring along to a holiday gathering. In a medium glass or stainless steel bowl, combine the condensed milk, vanilla and peppermint extract. Stir in the chocolate chips and butter. Place the bowl over a saucepan of barely simmering water and stir constantly, until the chocolate chips have melted and the mixture is smooth, about 6 to 8 minutes (mixture will be very thick). Using a spatula, scrape the mixture into the prepared pan and smooth the top. Sprinkle the crushed candy canes evenly over the top and gently press down. Refrigerate for at least 2 hours, or until firm. Remove the fudge by lifting out the tinfoil and transfer to a cutting board. Peel off the tin foil and cut the fudge into 2-inch pieces. Store in an airtight container in the refrigerator for 6-7 days.